During the use of the garlic peeler, it is necessary to check various parts of the device and make sure they are in good condition. Repairs should be done immediately whenever any problem is spotted. less clean, the peeling bucket must be cleaned immediately. At the end of each shift, submerge a rag in hot water and use it to wipe the wall of the feed-in bucket and the round rubber plate of the feed-in controlling valve. 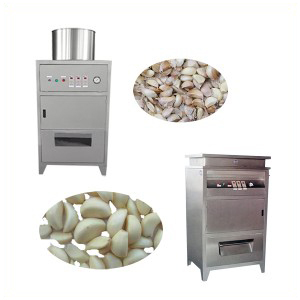 Garlic oil and crumbles must not be left there, which can cause inhomogeneous material entry and adversely affect the garlic peeling effects. wiped clean with a hot wet rag. Otherwise, the garlic peeling effect might be adversely affected. The control panel shall be kept dry. No water shall be used for its cleaning, in case of accidents. There is a drainage switch located at the lower part of the oil/water separating filter. Frequently activate the switch to drain the moisture so as to keep the air dry. For the type with triads, oil shortage must be prevented in the oil storage bucket so as to ensure the peeling effect and protect the components. Frequent checks shall be done to the various components and pipelines in the airflow circuit. Once a leakage is spotted, immediate repairing and replacement of components or pipelines must be done.